Industry trade publication Stone World recently revealed that 15 homes have been built for veterans thanks to Natural Stone Institute participating members! Our own Laura Grandlienard serves as chair of the NSI R.I.S.E. committee. “Being involved with the R.I.S.E. program enables our industry to take a leadership role in supporting these veterans and their families who have endured so much to protect our freedoms,” said Grandlienard, who not only chairs the membership committee but shepherds ROCKin’teriors’ participation as a project donor. “We feel tremendous pride in sharing our talents for such an important cause. It’s a beautiful feeling to say ‘welcome home’ to these heroes,” she said. Last year, ROCKin’teriors honored retired USMC Sergeant Michael Frazier and his wife Monica by helping to build a smart home for their growing family. Sgt. Frazier was wounded overseas while helping to preserve our freedom. 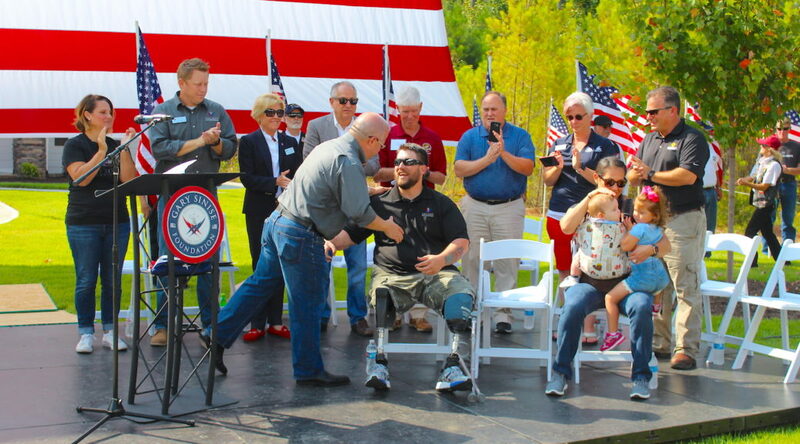 “We are honored to partner with Gary Sinise Foundation and the Natural Stone Institute to recognize the sacrifice Sgt. Frazier and his family have made,” said Grandlienard. The Gary Sinise Foundation was established under the philanthropic direction of a forty-year advocate for our nation’s defenders, actor Gary Sinise. Outreach supports those who sacrifice to defend our country: active duty, veterans, first responders, and their loved ones. While the Foundation’s mission is broad, the organization has created nine key programs to show gratitude for our American heroes through entertainment, family support, and acts of appreciation. Each home built in the R.I.S.E. program features automated amenities to ease the daily challenges these heroes face. In addition, R.I.S.E provides adapted vehicles, mobility devices, and home modifications to injured, wounded, ill and/or aging heroes from all conflicts.